Social Policy for Social Work provides a comprehensive, critical and engaging introduction to social policy for students and practitioners of social work. Part three focuses on key issues such as tackling divisions and inequalities, the control of services including empowering people receiving services, and future policy trends. Additionally, appendices provide a key to common abbreviations, dates of the main legislation and internet addresses of main information sources on policy and research. Illustrations from practice are included throughout to highlight implications for social work practice. The text focuses on contemporary Britain but also draws examples from European, global and historical contexts wherever appropriate. 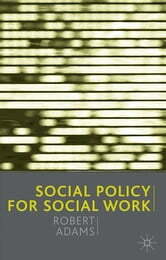 This exceptional text demonstrates clearly the relevance and implications of social policy for social work practice. It is an essential and practical resource for all students and practitioners in the welfare field.